Guitar slingers from far and wide will converge in Nashville to honor this historic, groundbreaking musician. 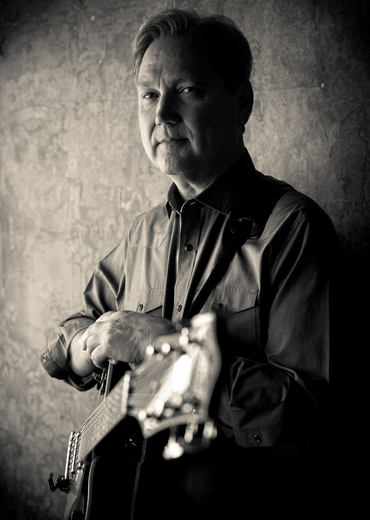 The lineup continues to grow, and currently features Tommy Emmanuel (CGP), John Knowles (CGP), Steve Wariner (CGP), Pat Bergeson, Thom Bresh, Doyle Dykes, Parker Hastings, Rory Hoffman, Rob Ickes & Trey Hensley, John Jorgenson, Laurence Juber, Andy McKee, Jack Pearson, and Eddie Pennington. In commemoration of what would have been Travis' 100th birthday year, several world-renowned guitarists will gather together for one very special night only to honor his contributions to guitar and music through a series of phenomenal performances, all-star collaborations, and a once-in-a-lifetime jam. The concert is presented by Bigsby® and the GRAMMY Museum®. Scott Goldman, the Executive Producer of The GRAMMY Museum®, will serve as host for the evening. Proceeds from the concert will benefit The Music Education Programs of The GRAMMY Museum. Lavishly talented, Merle Travis enriched popular music with his guitar playing, songwriting and singing. His picking style, a fusion of techniques he learned as a boy from local players, “involved picking syncopated accompaniment on the bass strings with the right thumb while simultaneously playing lead on the treble strings with the index finger.” It was a style that influenced guitarists as diverse as Chet Atkins, Doc Watson and Travis’ virtuoso son, Thom Bresh. Travis' songs—among them “Sixteen Tons,” “Dark as a Dungeon,” “Cannonball Rag,” “Smoke! Smoke! Smoke! (That Cigarette),” “So Round, So Firm, So Fully Packed” and “I Am a Pilgrim”—routinely crossed genres and were recorded by such artists as Tennessee Ernie Ford, B. B. King, Sammy Davis Jr., Tom Jones, Stevie Wonder, Ricky Nelson, Barbara Mandrell, the Byrds, Harry Belafonte, Johnny Cash, the Platters and the Chieftains. Travis appeared as a soldier in the movie From Here to Eternity leading a sing along of his own “Re-enlistment Blues.” His singing style was relaxed and conversational, a perfect vehicle for his cinematic lyrics. Travis, born in Rosewood, Kentucky, is aCountry Music Hall of Fame and Nashville Songwriters Hall of Fame inductee. Since opening in 2008, over 230,000 students have participated in GRAMMY Museum education programs. From workshops created around common core state standards, to our career-based Backstage Pass program, students are offered the opportunity to learn about English, history, science, math and politics through music. Our GRAMMY Camp, Career Day and Careers Through Music Curriculum offer high school students around the country access to insight and information about the variety of careers in music. In addition, through daily school tours and over 180 workshops per school year, the GRAMMY Museum offers scholastic, enrichment, career development and outreach programs for students and educators. Since the 1950s Bigsby Vibratos have been the choice of serious guitar players and premium guitar builders worldwide. Invented by genius engineer and designer Paul Bigsby who created a "vibrato that works" for lightning fast guitarist Merle Travis, the authentic Bigsby "True Vibrato" adds tone and expression and a whole lot more. They've been featured continuously on Gretsch guitars since 1955, and have been heard on recordings in almost every genre, from punk to folk, and country to rock. Guitar makers of almost every style turn to Bigsby to add the finishing touch to their instruments: a beautiful, subtle, and extremely functional statement.